Peer-review is an evaluation process in which qualified individuals within specialized field of study reviews literature before it becomes published. This process helps keep standards held by the profession, improves the quality of work being published, and provides credibility & reliability to published work & authors publishing the work. 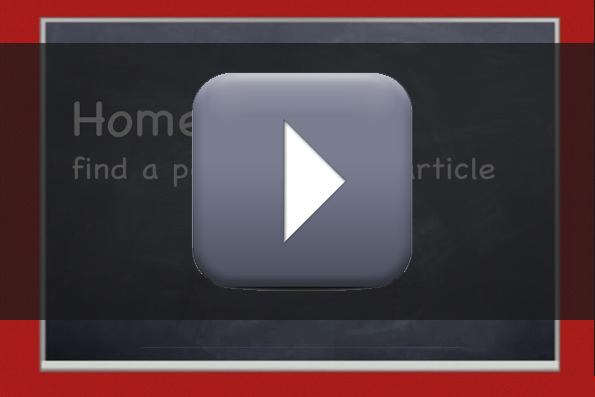 The 5-minute video below describes and discusses the importance of peer-review and its process. Wikipedia can be a good resource for getting general info about something, but because anyone can contribute or change its content, it is considered unreliable. College faculty typically do not consider Wikipedia a credible stand-alone information source. You can turn directly to the sources referenced at the bottom of most Wikipedia entries, to get more detailed information about the nuances & historical items of interest that were summarized by Wikipedia. You can also supplement or verify the information found in Wikipedia by using the library's print or electronic encyclopedias, dictionaries, or other reference books to backup the basic information of your research paper. These library oriented resources have gone through an editorial process to check for accuracy. Many databases offer a quick way limit your results to peer review literature. 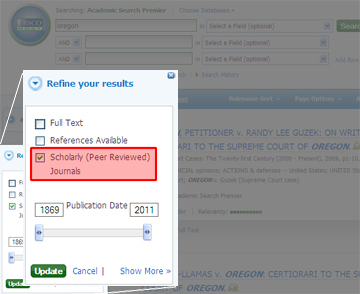 Databases, such as Academic Search Premier, have a box to check for scholarly, peer-reviewed articles. Below is a screenshot of a database that has a check-box to limit results only to scholarly, peer-reviewed articles. What information can be gained about a website's domain code of the host address? Does the document provide references to other more detailed resources (either print or online)? Are links to other Web resources labeled clearly? Does the author list where they get their information from (e.g. footnotes, bibliography, or reference list)?